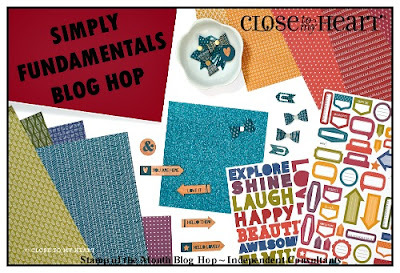 Paige Dolecki - Stampologist: Paper Fundamentals Blog Hop! Welcome to the Paper Fundamentals Blog Hop! Today we are spotlighting our fab and fun Paper Fundamentals which are part of November's Simply Fundamental Campaign. If you have come here from Jessica's Blog then you are on the right track. If you get lost along the way you can find the complete list of participating CTMH Consultants by clicking here. I created a custom cascading heart card front for this card and backed it with the chevron Sangria pattern. I really love the way the pattern peeks through! The sentiment is from our Sending Love stamp set and the stamped flower is from So Many Smiles. The pop up portion is from our Artiste Cricut Cartridge. See the two hearts on the side? I sponged ink on the revers side of two hearts that were cut from the front. One side of the Paper Fundamentals has a pattern (the Champagne colored paper you see) and one side has a resist pattern so when you ink it leaves the pattern on the paper in the original color of paper. You can create some VERY cool effects with this product! Now hop on over to Krista's blog and see the beautiful project she has created to share with us today! Very cool idea!! Love it!